You can find the most important things there – add a topic, add a subscription and the connection strings. If you don’t have any messages in your subscription (e.g. 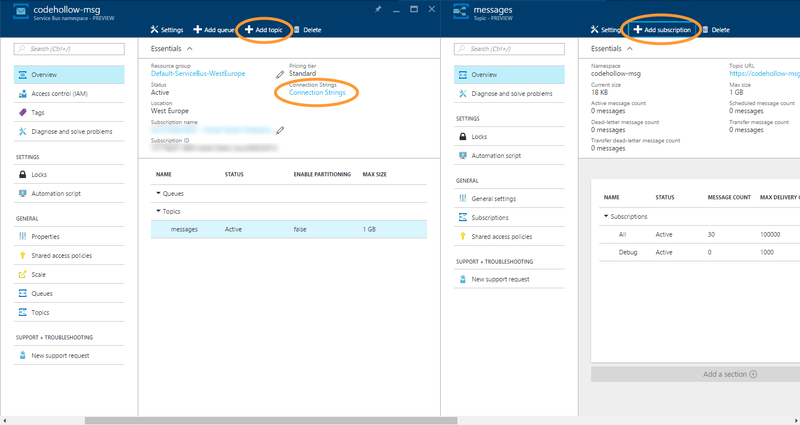 because you created a new one) – the simplest way is to use the ServiceBus explorer (also described in this blog post). If all prerequisites are met, you can use the following script to test a filter against an existing subscription. If you want to create a new subscription based on the new filter, you can simply uncomment the last line and replace the subscription name with the one that you prefer. The script is just to demonstrate how to use the date time filter. It defines a filter for messages that were sent to the ServiceBus (sys.EnqueuedTimeUtc) in the year 2016 (between 01.01.2016 and 01.01.2017). If you execute it and you don’t see any messages – please ensure that there are already messages in the subscription. The script shows the first 100 messages that are available and after that it shows the ones that matches the filter. If “all messages” doesn’t show anything – use servicebus explorer (or whatever you like) to send some test messages to your topic/subscription. After that we can use the following piece of code which does the same as the Powershell script above. In fact it is the same as the script above – just translated to C#.